The CG Emanuel Group (TEG) offers a unique blend of expertise in negotiation, launching and expanding campaigns, and advocating both to the public and in the political arena. 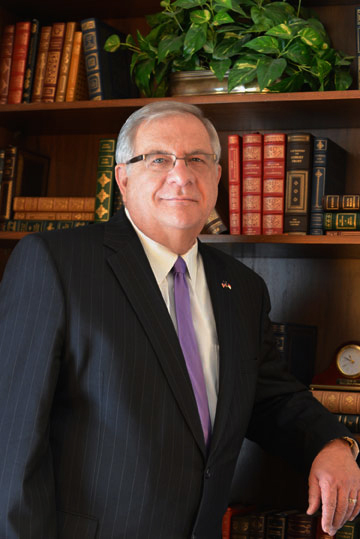 Utilizing decades of experience in management and strategic decision-making, The CG Emanuel Group can help meet your goals using extensive statewide resources. The CG Emanuel Group has developed a broad network of key decision-makers throughout North Carolina. We can take your strategic goals from concept to completion by utilizing the media, legislative advocacy, and by using proven internet strategies, including targeted websites and social media. We remain committed to education, technology, and job growth by using North Carolina’s top-tier work force to benefit companies who are considering business growth. Contact us today to discuss how The CG Emanuel Group can help you meet your objectives. 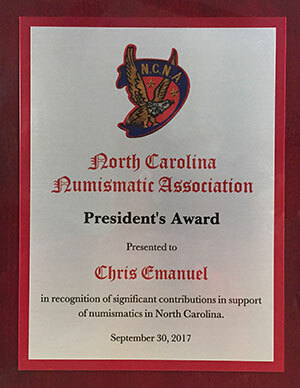 Chris Emanuel, director of the CG Emanuel Group, has been presented the President’s Award by the NC Numismatic Association for his efforts in eliminating the sales tax for collectable gold and silver coins, currencies, and bullion in North Carolina. The award was presented to Emanuel on September 30, 2017. The Emanuel Group has expertise and an interest in several areas that are vital to the growing economy in North Carolina. Our focus remains on helping companies develop new infrastructure and bring jobs and technology that help the State and its citizens keep an edge on innovative and forward-thinking initiatives. EDUCATION: As an airline executive, Chris Emanuel oversaw vital training and continuing education for the airline industry. He is a tireless advocate for proper training and the need for technical education initiatives around the State. “Without a trained workforce, North Carolina cannot enjoy the technological edge it enjoys today,” he says. “We will work with corporate clients to tie their relocation efforts to proper educational initiatives that will provide them with a trained workforce.” Legislative and grassroots efforts in that regard can help boost local and statewide economies. TECHNOLOGY: Recognizing that North Carolina is among the leaders in the nation in technology because of its tremendous commitment to higher education, TEG seeks to align technology companies with some of the best trained technology graduates in the world by encouraging corporations to invest in North Carolina. ENVIRONMENTAL & INDUSTRIAL SERVICES: TEG is dedicated to introducing the latest technologies available to North Carolina businesses for effective compliance with State and Federal laws. We work with companies that specialize in environmental cleanup and regulation, and can help industry stay compliant with the law. INSURANCE: Insurance is critical to the stability of the State’s economy, and TEG works with carriers to expand their reach in NC through acquisition of State contracts. ENERGY EXPLORATION: Self-sufficiency in energy has become a vital part of the U.S. energy policy. While supporting exploration of alternative energy sources, TEG continues to work to offer legislative support for traditional energy exploration companies by lobbying for tax breaks for infrastructure development, and training and hiring of a local workforce. We will support companies not only through legislative initiatives but also through contact with State agencies such as the Department of Environmental and Natural Resources (DENR), the NC Mining Commission, and local geologists. AGRI-BUSINESS: TEG realizes the importance of traditional industries that have kept North Carolina strong in the agricultural business. We work with agri-business to promote the welfare of NC farmers by negotiating brokering/funding agreements with the State. UNMANNED AIRCRAFT: The Emanuel Group CEO, Chris Emanuel, is a retired airline pilot and executive with 38 years of experience in the airline industry, and has unique experience and expertise in the growing area of civilian unmanned aircraft. “Unmanned Aerial Systems technology is quickly becoming vital for civilian applications,” Emanuel says. “We are committed to introducing this valuable cutting-edge technology to law enforcement and those responsible for monitoring and responding to emergencies and natural disasters.” Emanuel has decades of experience in Federal and State aviation laws, and the commitment to introduce this vital technology to lawmakers. COUNTY/MUNICIPAL INITIATIVES: The Emanuel Group has spent several years launching grassroots political efforts in counties across the State. We take pride in our contacts and relationships at the local/municipal level and can help forge lasting relationships between local officials and corporations exploring relocation options. TEG believes that “boots on the ground” are needed to take accurate and pertinent information to State lawmakers. Why The CG Emanuel Group? The CG Emanuel Group (TEG) is a pioneer in introducing the value of unmanned aircraft technology and bringing fresh energy exploration initiatives to North Carolina. TEG utilizes its vast experience and extensive network of statewide connections to deliver your message to your intended target. We utilize top business and political operatives, and an experienced technology team to implement your plan in an effective and timely manner. Contact us today at Chris@TheEmanuelGroup.com.